Need an easy sauce for asparagus? 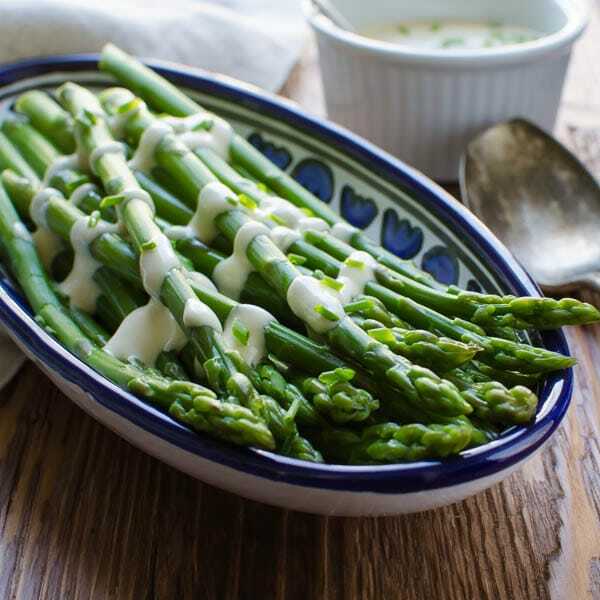 The dijon sauce for this Creamy Dijon Asparagus takes about 2 minutes to assemble and makes a great dressing for steamed or blanched asparagus. 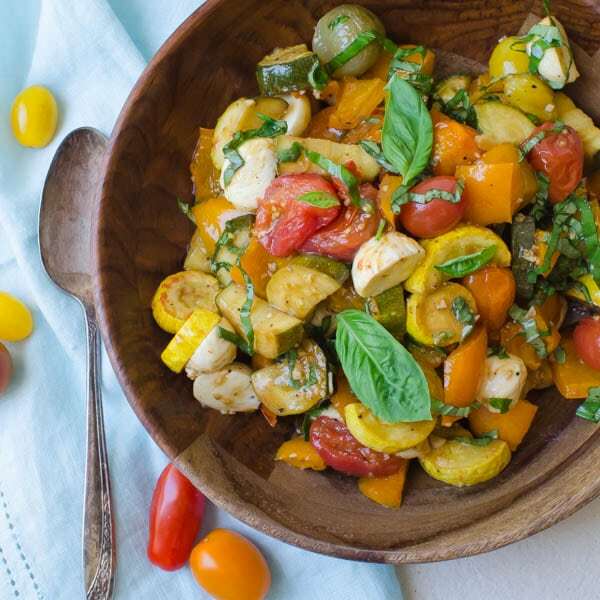 Serve hot or cold for a delicious gluten-free, vegetarian side dish. This Creamy Dijon Asparagus recipe isn’t really a recipe at all. It’s just the way my family does it. One of those dishes that we have so often, we don’t even think about it — but then we serve it as a side dish at a dinner party and the guests ooh and aah — and we realize that just because it’s an everyday thing in our regular repertoire, it’s not in everyone’s. And it should be. The beauty of this dish is in its simplicity. 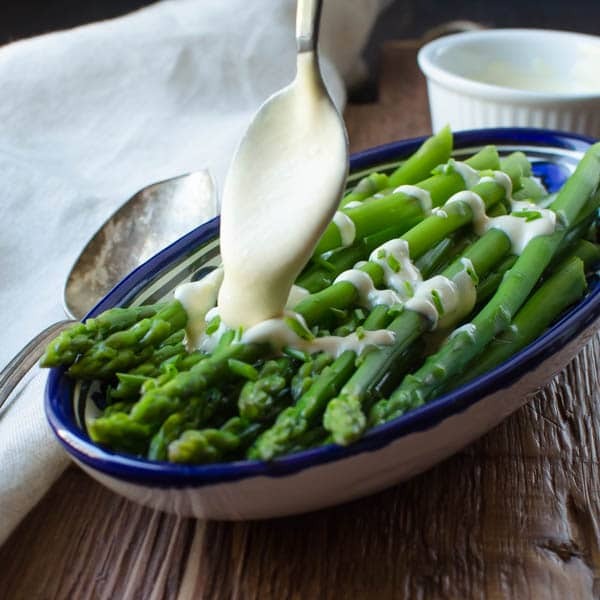 Its little more than blanched asparagus with a tangy, creamy embellishment that takes all of 2 minutes to make. 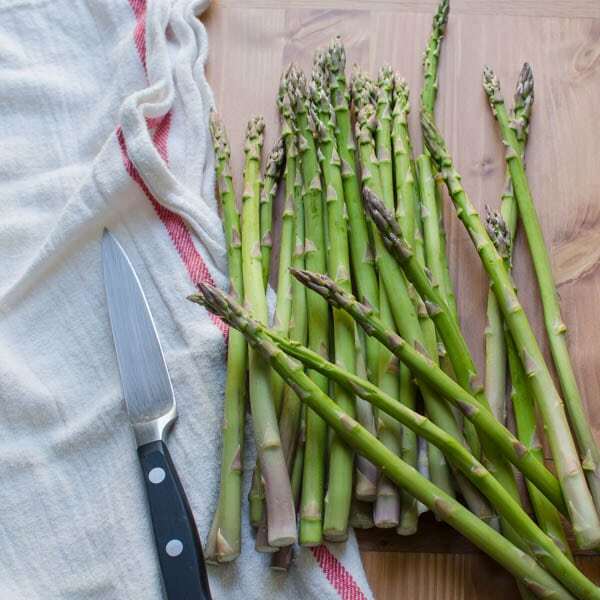 Trim the tough ends of the asparagus — and save them for making vegetable stock. As far as the size of the asparagus, I personally prefer the long, pencil-thin spears, but others swear by the shorter, thicker ones. Either way, it’s the sauce that makes it. 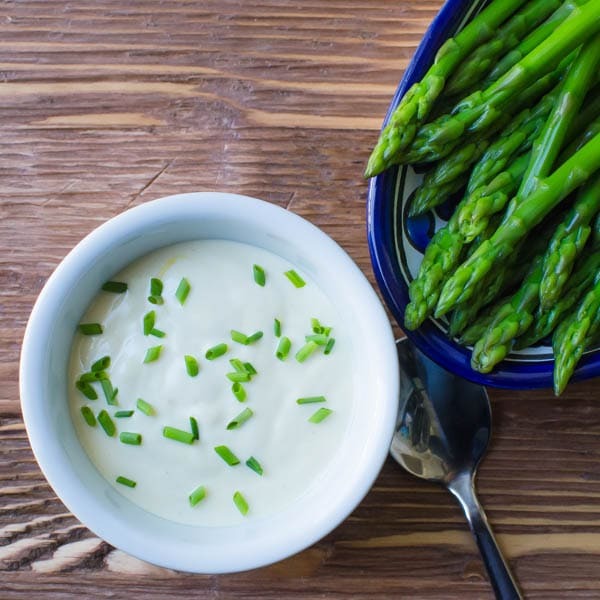 Sauce for Creamy Dijon Asparagus Is Ridiculously Easy! 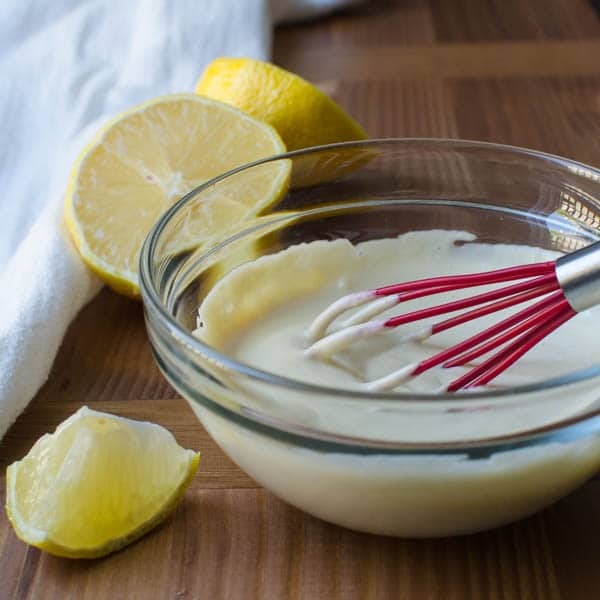 The creamy dijon sauce has only 3 ingredients — dijon mustard (duh), mayonnaise and a squeeze of lemon juice. 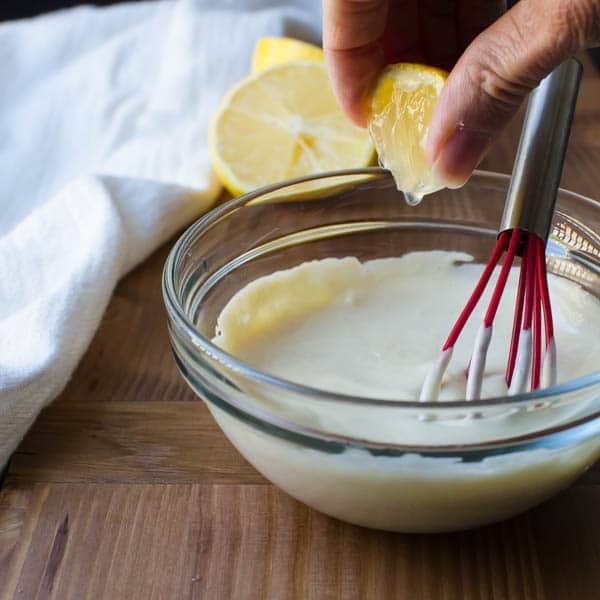 Mix it in a small prep bowl and serve it alongside the asparagus or drizzle it over the top. I added chopped chives for the pictures to give it dimension, and a peppery bite, but they’re completely optional. We like this as a hot side dish with fresh grilled fish (the sauce is great on the fish as well) or any other protein, but it’s also delicious served chilled or at room temperature… The only difference in prep is to “shock” the asparagus in an ice bath after blanching it. Shocking stops the cooking process and “sets” the bright green color. 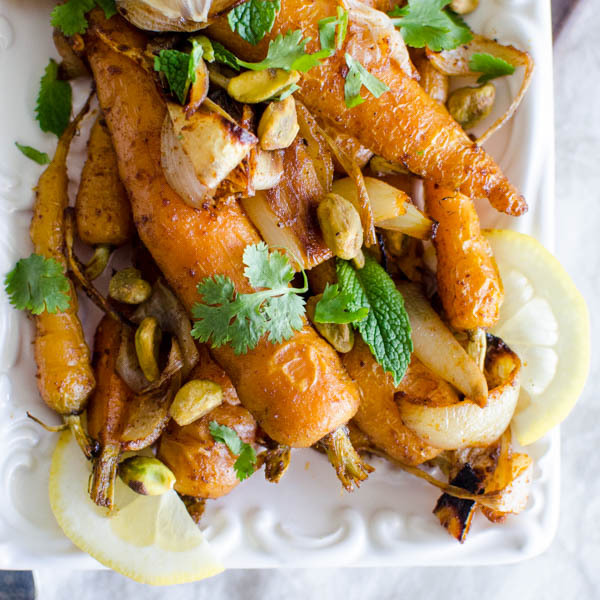 Nothing could be simpler or more delicious than this easy side dish. That's probably why we make it so often. Add 1 inch of water to a 10" skillet with a lid. Bring to a boil. Add the salt to the water and when it's dissolved add the asparagus. Cover with the lid and cook for 3-4 minutes or until desired tenderness is achieved. 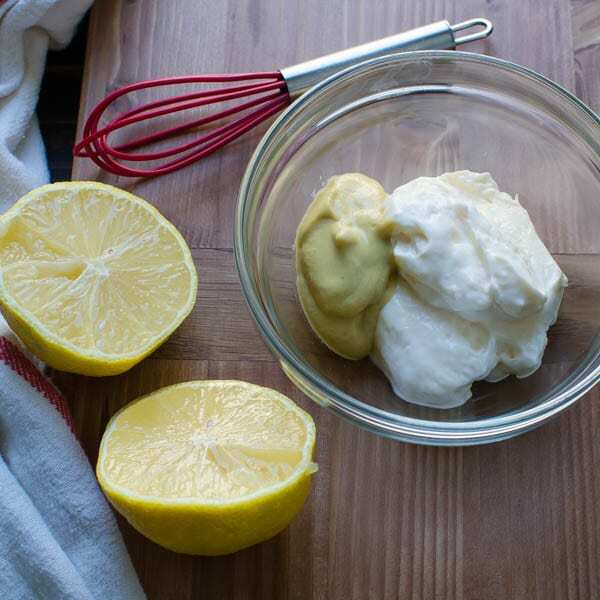 In a small bowl, combine the mayonnaise, mustard and lemon juice. Stir to combine and set aside. With a pair of tongs, transfer the asparagus to a serving platter. Spoon the dijon sauce over the top and sprinkle with chives -- or pass the sauce and chives separately around the table for guests to add themselves. This is a good dish for a Spring or Summer buffet and can be served chilled. 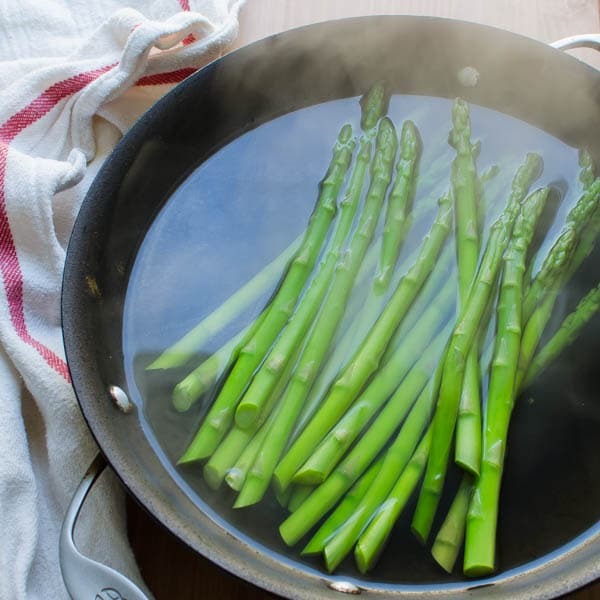 Cook the asparagus for the appropriate time, then transfer the spears to a ice bath to shock them and retain the color. Refrigerate the asparagus and dijon sauce separately. 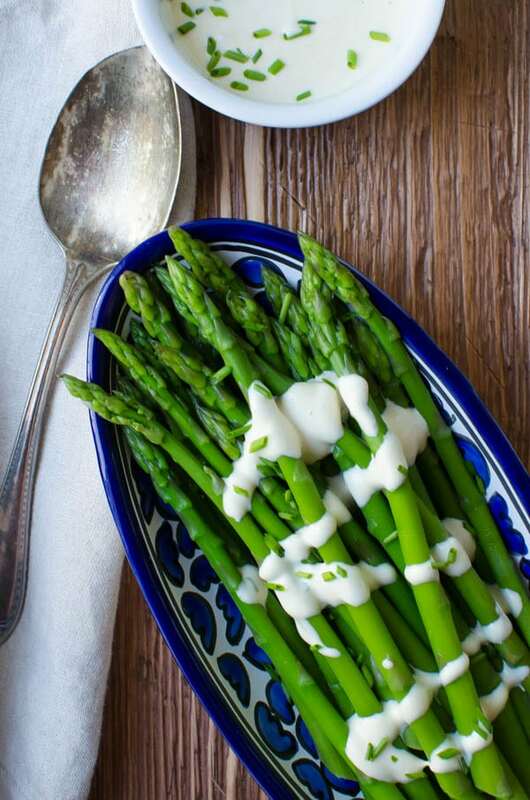 When you're ready to serve, garnish the asparagus with dijon sauce and chives. 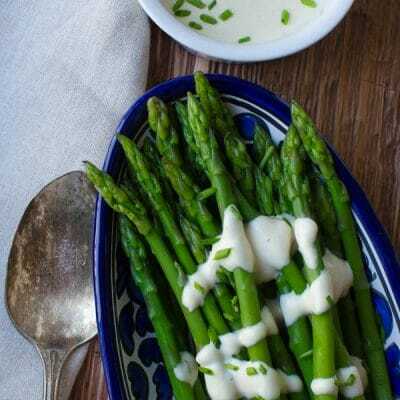 Pin “Creamy Dijon Asparagus” For Later! That’s great! Easy, isn’t it? I am sooo ready for asparagus season! I usually don’t sauce mine, but this sauce looks amazing!! I will definitely try it this spring as soon as we get some asparagus! 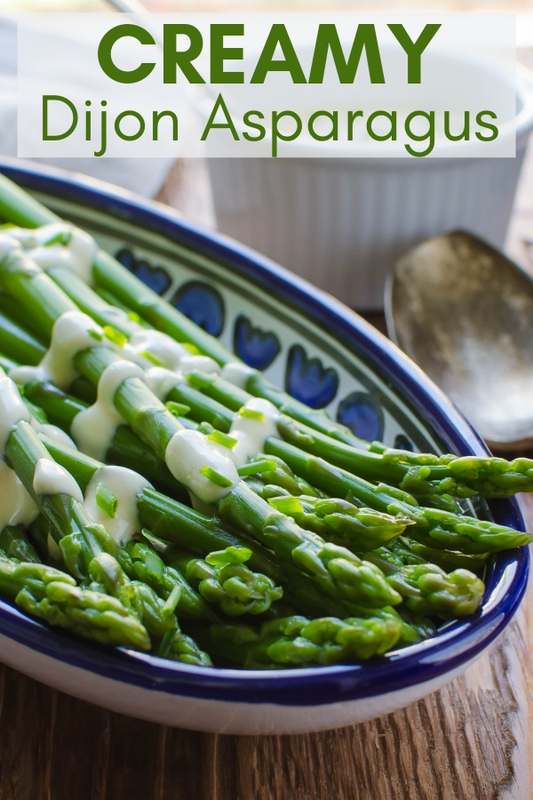 I love asparagus and love dijon sauce but have never tried the two together – something new I am going to have to try! Dijon and asparagus happens to be one of my favorite flavor combinations, especially in the spring. These look gorgeous and can’t wait to share them!